Ranjit Hotel is conveniently located in Agra and is known for its exceptional services and friendly staff. Ranjit Hotel offers basic comforts and services for leisure travelers. It provides basic amenities for its customers and is a family-friendly hotel. Each of the rooms have a contemporary design and are aesthetically pleasing as well. 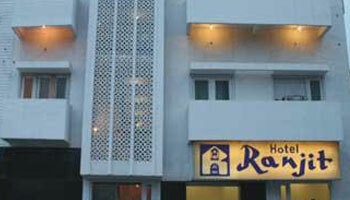 Ranjit Hotel is located near the commercial and tourist areas of Agra. The famous places that attract attention are Taj Mahal, the epitome of love, Fatehpur Sikri, Agra Fort, Akbar's Mausoleum at Sikandra, Kinari Bazaar and Dayal Bagh Temple. Ranjit Hotel is 5.5 kilometers away from Taj Mahal and is within walking distance of the Agra Cantonment railway Station. The nearest airport is 6 kilometers away. Security Guard, Backup Generator, Doctor on Call, Airport Transportation, Laundry Facilities, Parking, Breakfast Services, Currency Exchange, Travel Counter, Room Service. Cable/Satellite TV, DVD Player, Air Conditioning Room, Toothbrush/Razor on Request, H/C Water, Attached Bathroom, Wakeup Calls, House Keeping, Iron/Ironing Board.